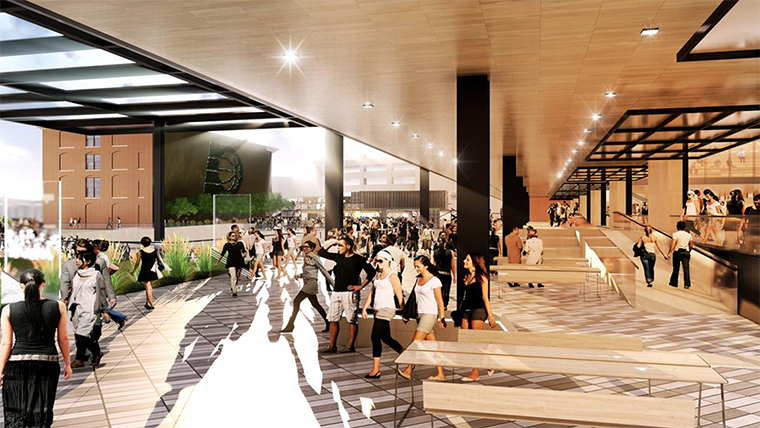 The Capital Improvement Board has approved a 25-year deal with the Indiana Pacers that will fund a $360 million renovation and expansion of Bankers Life Fieldhouse, including an outdoor entry plaza to the north and trendy new gathering spaces inside. The CIB and the city will pay for the bulk of the project—$295 million—with Pacers Sports & Entertainment kicking in $65 million. Combined with additional spending on technology, maintenance and general operating expenses, the deal could cost the CIB—a quasi-government agency representing the city—nearly $800 million over the life of the 25-year deal, which is contingent on legislative approval of a bill that would shift millions in state tax revenue to the CIB. The unprecedented agreement, which has the option for up to three one-year extensions, commits the CIB to spending up to $120 million on technology upgrades, an average of $14.5 million per year on operating expenses, $17.6 million on maintenance and repairs and $4.6 million to license the video and sound system. The agreement is the longest—and most expensive—deal between the city and the Pacers yet. It replaces the current Pacers lease, which runs through the 2023-2024 season. Herb Simon, the 84-year-old owner of the team, has said he wants to keep the Pacers in Indiana, even after he is no longer the owner. Simon plans to pass his sole ownership on to his son, Steve Simon, who lives in San Francisco. 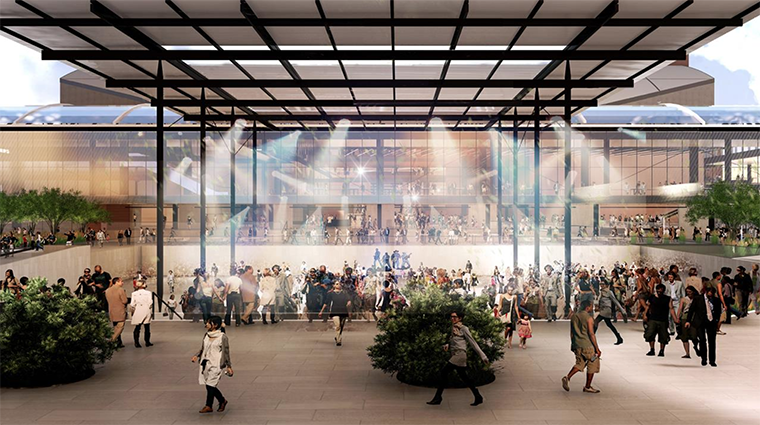 The project’s most striking change will be the creation of a year-round outdoor gathering space on the north side of the fieldhouse, along Maryland Street, that will lead to a new entry on the north side of the building. The plaza would replace an existing, 770-space parking garage. 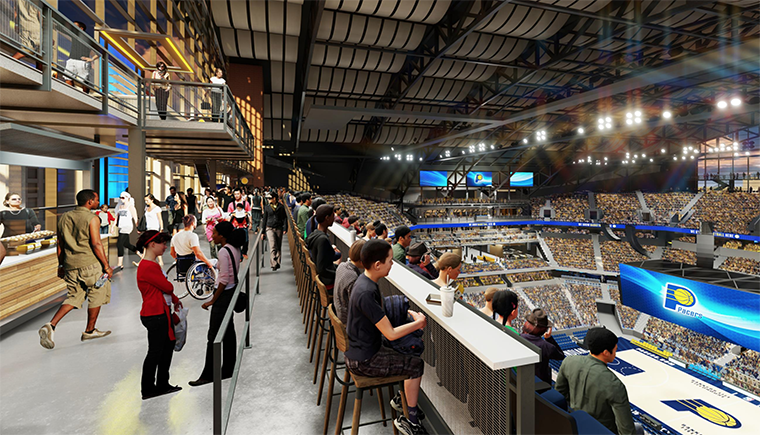 The renovation project also will reconfigure some of the seating in the fieldhouse to allow for more gathering spaces—a trend that other recently updated arenas have been embracing. The fieldhouse, which opened in 1999, cost $183 million to construct. 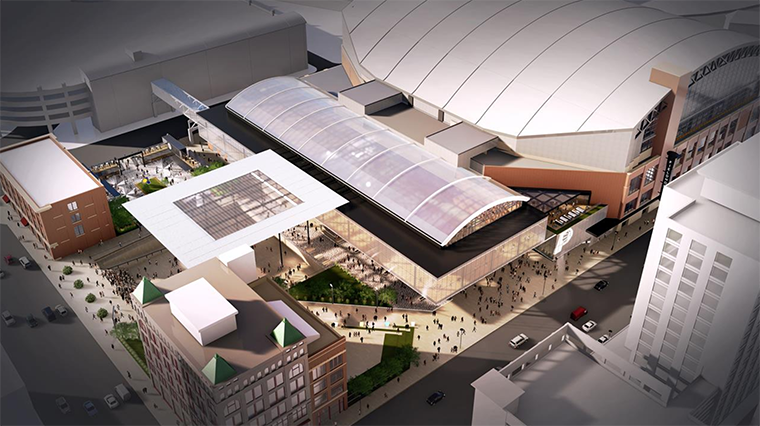 Construction is expected to begin next year after the Pacers season ends, but the project will be on hiatus between October 2020 and the NBA All-Star Game in February 2021. The final phase of the project, which will include the outdoor plaza, is expected to be completed in the fall of 2022. The expansion involves tearing down the parking garage on Maryland Street between Pennsylvania and Delaware streets and eliminating the alley that runs along the north side of the fieldhouse. 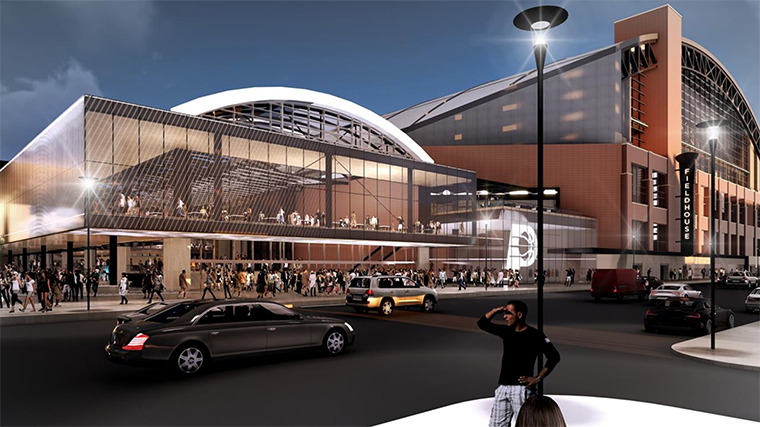 The parking garage will not be torn down until after the NBA All-Star Game in 2021. 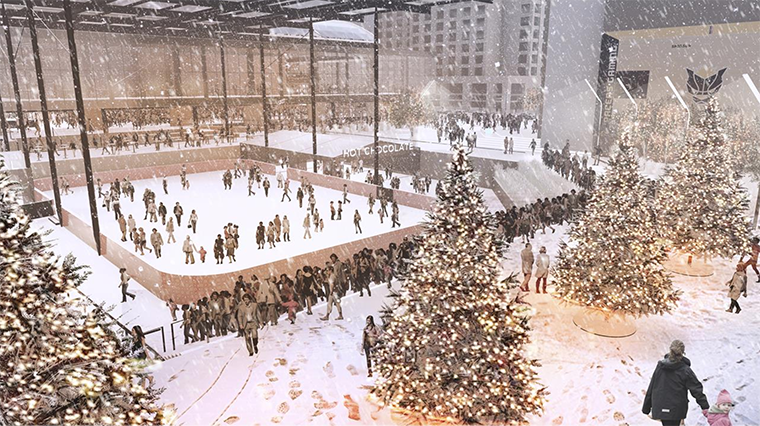 Rick Fuson, president and chief operating officer of the Pacers, said the outdoor plaza will be a public gathering space that could be used for events like live music and include an ice skating rink in the winter. “It becomes a year-round entertainment opportunity,” Fuson said. The Pacers will contribute $65 million toward the project, the CIB will pay $270 million and the city of Indianapolis will pitch in $25 million for public infrastructure over three years. Three parcels of property will need to be acquired to accommodate the expansion. They are expected to cost a total of $38 million. The Pacers are footing that bill—the contract requires the Pacers to contribute $38 million to the project up front—but ownership of the property eventually will be transferred to the CIB. The remaining $27 million from the Pacers won't have to be paid until after all the CIB and city money is spent, according to the agreement. That funding will go toward construction costs. 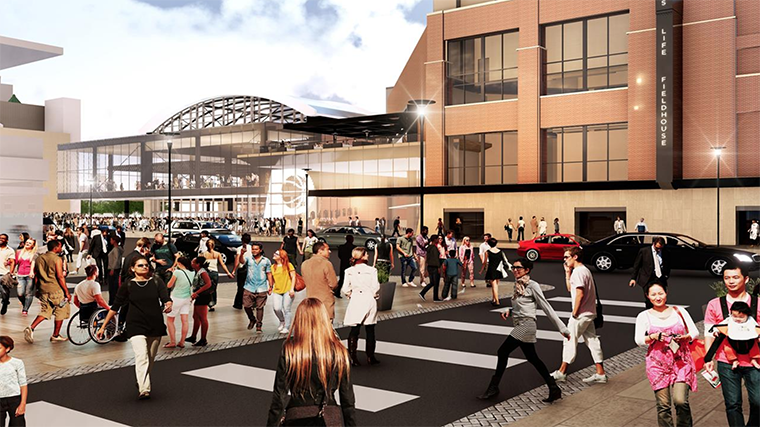 City leaders say they are excited about the potential to connect the Bankers Life Fieldhouse area to the Indianapolis Cultural Trail and the added appeal it could bring to the nearby properties, including the Marion County Jail, 40 S. Alabama St., which will be vacated once the new Criminal Justice Center opens in 2022 in the Twin Aire neighborhood. “We love the connectivity of public space,” said Thomas Cook, chief of staff for Indianapolis Mayor Joe Hogsett. Inside the fieldhouse, the renovations will focus on creating more gathering spaces—a move that will leave the approximately 18,500-seat arena with fewer actual seats. The balcony level will be reduced by eight rows on each side, and the number of suites will shrink from 64 to 56. But that doesn’t mean fewer tickets would be sold. The capacity of the building will remain the same, Fuson said. “We think you’ll see a major transformation of the building,” Fuson said. As part of the construction schedule, the building won’t host any events in the summer of 2020 or the summer of 2021. The Indiana Fever, the WNBA team that plays its home games at the fieldhouse, would have to find an alternative venue for two seasons. Fuson said the team is looking into potential relocation options. 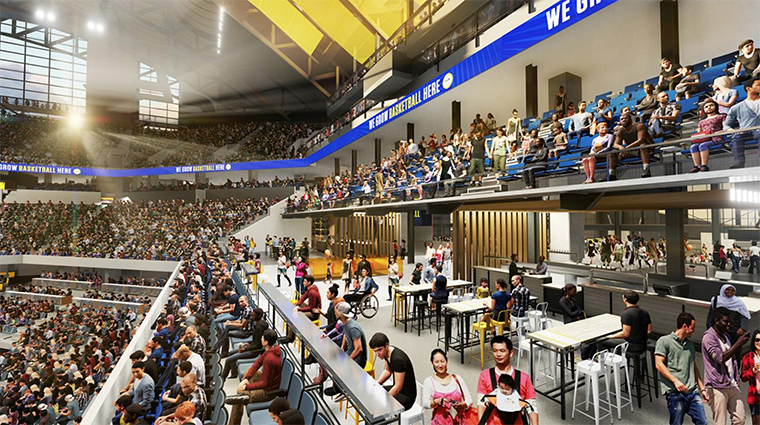 For years, the Pacers and city officials have pointed to improvements other cities and NBA teams have made in their arenas as a justification for upgrading Bankers Life Fieldhouse. But the cost revealed Friday morning—$360 million—is higher than the renovation costs of some other NBA venues. For example, Atlanta and its NBA team, the Hawks, recently spent nearly $200 million to renovate Phillips Arena, which opened the same year as Bankers Life Fieldhouse. The team contributed $50 million and agreed to stay in the city through 2046, while the city paid $142 million. In Cleveland, the Cavaliers and city are pursuing a $185 million renovation of the Rocket Mortgage Fieldhouse, with the team paying $115 million and the city $70 million in exchange for the team’s lease extending through 2034. In Indianapolis in recent years, Herb Simon and CIB split the $16 million cost of a new scoreboard and audio and video system. And the Pacers spent $52 million to build the St. Vincent Center practice facility across Delaware Street from the fieldhouse. 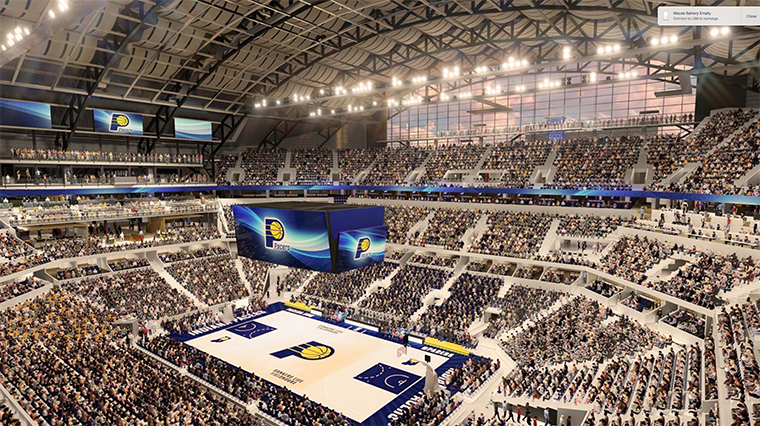 The 10-year agreement signed between the CIB and the Pacers in 2014 included the CIB's funding $26.5 million in improvements to locker rooms, concession stands and video boards. According to the agreement being considered Friday morning, the CIB still hasn’t spent $1.6 million of that commitment, and that money will roll over into the new contract. “We have great bones in this building,” Fuson said. The Pacers stress that the building is used for more than just basketball. In 2017, more than 550 events and meetings took place at the fieldhouse, with more than 1.7 million visitors walking through the doors. In fiscal year 2018, the fieldhouse generated economic contributions of more than $370 million, according to research the Pacers commissioned from the Public Policy Institute at Indiana University. Over the course of the 25-year deal, the biggest cost to the CIB will be the operating expense payments, which could total up to $362.4 million. The CIB owns the fieldhouse, but the Pacers are responsible for managing the facility. 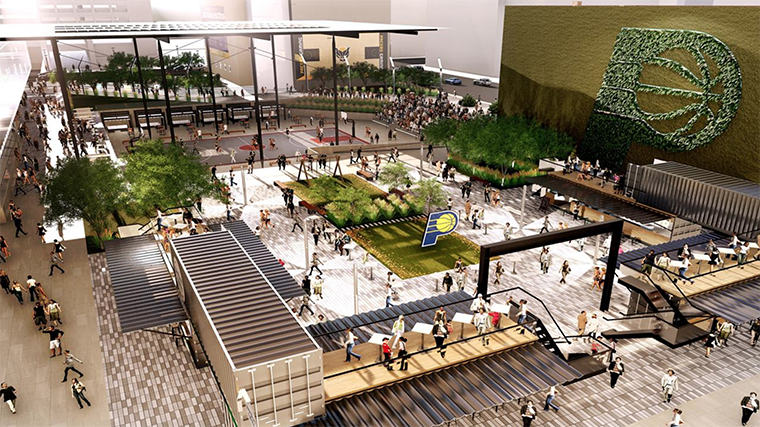 The CIB also eventually would own the additional property being acquired for the expansion, but the Pacers would be responsible for maintenance and upkeep of the outdoor plaza. The amount the CIB will pay the Pacers for operations gradually increases—up to $12.5 million would be paid annually from 2019-2024, $13.1 million from 2025-2030 and $16.1 million from 2031-2043. The CIB also will contribute a total of $120 million through 2034 for technology upgrades—and possibly more in the years that follow. The contract requires the CIB and the Pacers to meet in 2036 and discuss what future technology needs will be through the 2044 and negotiate how much the CIB would have to spend in the last eight years of the agreement. If the Pacers and the CIB don’t reach an agreement on additional technology funding by 2036, the Pacers could terminate the contract. The CIB also would continue to pay for the video and sound system licensing fee, which was included in the previous 10-year contract with the Pacers. The remaining payments total $4.6 million through 2023. The contract also requires the CIB to pay $17.6 million over the next three years for what’s described as “scheduled capital repairs and replacements.” Some of the work includes improvements to parts of the heating and cooling system and elevator repairs. The CIB is emphasizing that the deal does not require any new taxes or fees. “We think that’s very, very significant,” CIB President Melina Kennedy said. In a statement, Hogsett added: "I want to applaud the hard work of the Capital Improvement Board and Indiana Pacers that resulted in the 25-year agreement approved today. I'm also proud that the strength of our city's decades-long sports strategy has allowed for a long-term deal that won't require one penny in new taxes or fees for Indiana taxpayers." But the deal does require the extension of some tourism-related taxes and capturing more revenue that would otherwise flow to the state and city governments. Senate Bill 7, which passed the Indiana House on Thursday and now returns to the Senate for further consideration, would allow the city to extend the admissions, auto-rental and innkeeper’s taxes through 2040. All of those revenue streams are otherwise set to expire in 2027. In 2017, those taxes generated $77.6 million for the CIB. So it would be a significant hit to the organization’s budget, which is $136 million this year, if they aren’t continued. The legislation also would expand what’s known as the Professional Sports Development Area, a zone mostly downtown that captures state income and sales tax revenue generated at Lucas Oil Stadium, Bankers Life Fieldhouse, Victory Field, the Indianapolis Colts’ northwest-side practice venue and four downtown hotels. The new PSDA would add eight existing hotels to the footprint. The CIB would be allowed to capture up to $9 million in additional revenue in fiscal year 2022 from the new PSDA, up to $12 million in fiscal year 2023, up to $16 million in fiscal years 2024-2033 and up to $18 million in fiscal years 2034-2041. The deal between the Pacers and the CIB hinges on state lawmakers' passing the bill—which requires the Pacers and the CIB to sign a 25-year agreement by April 20—and the city signing off on the taxes as well.